Frequently history is stranger than fiction and none more so than in the tale of Alexander Selkirk: the real-life Robinson Crusoe. Born in 1676, the seventh son of a cobbler, Alexander Selkirk grew up in Lower Largo, Fife. At the age of 19 he found himself in trouble with the Kirk Session after his brother’s trick of making him drink sea water resulted in a family fight. Before his case was heard, Selkirk fled to sea hoping to make his fortune through privateering (effectively legalized piracy on the King’s enemies) against Spanish vessels off the coast of South America. Within a few years his skill at navigation led to his appointment as Sailing Master on the ‘Cinque Ports’, a sixteen gun, ninety ton privateer. The expedition was a disaster. The captain of the ship was a tyrant and after a few sea battles with the Spanish, Selkirk feared the ship would sink. So, in an attempt to save his own life he demanded to be put ashore on the next island they encountered. In September 1704, Selkirk was castaway on the uninhabited island of Más a Tierra (today known as Robinson Crusoe Island), over 400 miles off the West Coast of Chile. He took with him a little clothing, bedding, a musket and power, some tools, a Bible and tobacco. At first Selkirk simply read his Bible awaiting rescue, but it soon became apparent that the rescue wasn’t imminent. He resigned himself to a long stay and began to make island life habitable with only rats, goats and cats for company in his lonely vigil. After several years of isolation, two ships drew into the island’s bay. Selkirk rushed to the shore, realising a little late that they were Spanish. Their landing party fired, forcing him to flee for his life although he managed to evade capture and the Spaniards eventually departed. Finally On 1st of February 1709, two British privateers dropped anchor offshore. Alexander lit his signal fire to alert the ships, who dispatched a rather astonished landing party to find a ‘wildman’ dressed in goat skins. Remarkably the privateers’ pilot was William Dampier, who had led the Selkirk’s original expedition and was able to vouch for the ‘wildman’. Selkirk had spent four years and four months of isolation on the island, yet seemed stable when he was found. The experience had, in fact, saved his life. From William Dampier he learnt that he had been right to leave the ‘Cinque Ports’, which had sunk off the coast of Peru with all of its crew drowned except the captain and another seven men, who had survived only to be captured and left to rot in a Peruvian jail. Selkirk re-embarked on his career as a privateer and within a year he was master of the ship that rescued him. In 1712 he returned to Scotland £800 richer, and surprised his family as they worshipped at the Kirk in Largo. They had long given him up for dead and were astonished that he was alive, let alone alive in his fine, gold and lace clothes. In 1713 he published an account of his adventures which were fictionalized six years later by Daniel Defoe in his now famous novel: ‘Robinson Crusoe’. 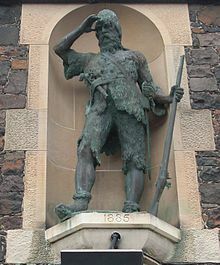 Selkirk, however, could never really readjust to life on the land, and, in 1720, a year after he was immortalized by Defoe, he joined the Royal Navy only to die of fever off the coast of Africa.